How inspiring to see a group of strangers in a restaurant gathered in prayer! 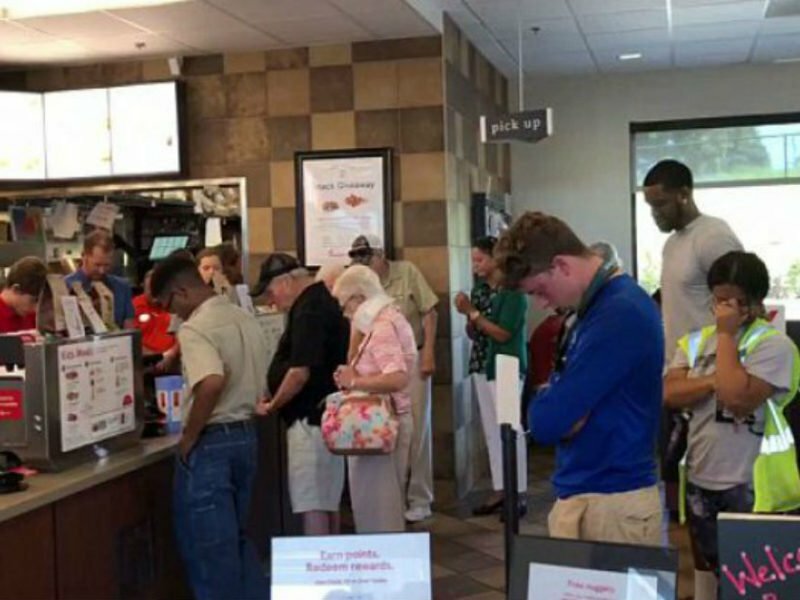 According to a video that has had more than 700,000 views, a Chick-fil-A in Belmont, North Carolina is serving up more than just chicken, they also offer prayer. In August 2018, a customer filmed a video of a very special occurrence seldom seen at a restaurant. The staff gathered around the serving counter to offer up a prayer for one of their staff members. Not only were the associates gathered to pray but, the patrons also participated in the prayer for this associate, known only as Ms. Trish. As she went into surgery, everyone offered up a prayer. “So if you all know her from our dining room, today is a rough day for us. We’re hoping that things will go well. If you’ll bow your heads – and I’m not great at this, but I’m going to do my best,” the manager continued. “Dear Lord, please protect Ms. Trish as she begins her surgery today. Please give the surgeon a steady hand as they perform the needed surgery on her,” he added. According to WJZY-TV, Ms. Trish did come through her surgery and is on the mend.